It’s been one of those days – you just get home from work and you are absolutely beat. BUT THE FAMILY IS HUNGRY! They want food and they want it now! What do you do? Order takeout? Head to the nearest fast food joint? That can get expensive after awhile. When I’m short on time, I like to whip up something from this list. 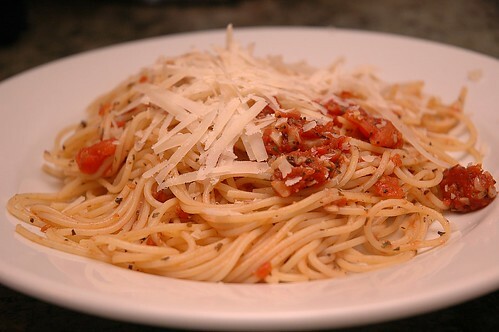 Pasta – Not only is is super simple to make, but it’s FAST! I can have a plate of pasta on the table for you in 15 minutes, tops. We make our homemade sauce, and that takes about 10 minutes. While it’s cooking, we plop the pasta into some boiling water and by the time it’s done, the sauce is finished as well. Mix them together, top with some cheese and VOILA! Dinner is served. 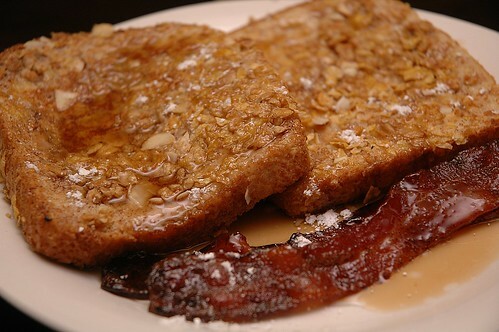 Breakfast – We love having breakfast for dinner once or twice a month. Sometimes we will have eggs, bacon and hashbrowns. Other times we will have fresh toast and fruit drinks. There are so many possibilities! 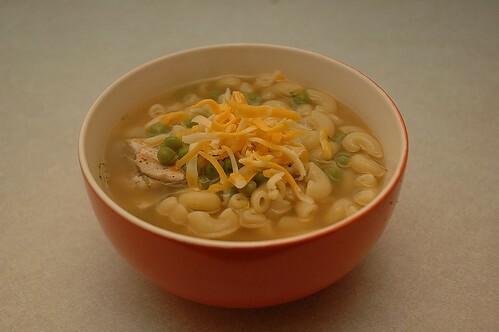 Soup & Salad – It’s pretty simple to make your own soup, and it really takes no time at all. We prefer to do this, so that we can control the things that go into the soup. However, if you’re just not up to making your own soup, feel free to just heat up the canned variety. Pair it with a simple salad and you’ve got an easy meal in no time at all! Fried Rice – Our fried rice recipe takes about 30 minutes from start to finish. The rice takes about 20 minutes to cook, but you could always use instant rice to make your cooking time a bit shorter. Once the rice is cooked you can add in any ingredients you want. We add some scrambled egg, bacon and baby peas. Sandwiches – There are a variety of sandwiches you could make for dinner. My favourite is a BLT, but you could also try deli meat, leftover chicken/turkey/roast beef, tuna, even peanut butter & jam! Have some salad alongside your sandwich to fill you up a bit more and get some veggies in ya. It’s easy to just call for delivery when you’re strapped for time and exhausted – but before you go that route, try making something yourself. You won’t believe how proud you will be for saving yourself some money and making a meal at home. What meals do you like to make when you’re short on time? Instant noodles.. chicken corn soup.. egg sandwiches. Breakfast for dinner is one of my favorite meals. Hot open faced sandwiches is another quick meal that also uses up leftovers. Bagged salad with tuna or slamon and cheese and a slice of toast is a favourite! Wieners and beans, chili and I love my crockpot! (I know that’s not really a quick meal idea, but if you prepare it in the morning, dinner is so simple to pull together that evening). alex – simple and delicious. thanks for sharing! michelle – great ideas, thank you! Digity Stew…..1 package wieners, slicedinto bite size pieces, fry with diced onion, brown with 1 T oil, add 1 cup rice, let brown for a few minutes, add 1 can of diced canned tomatoes, plus any kind of stock or water so the rice will cook, touch of worcHester sauce, cover and cook on low for 20 min or until rice is done Add fresh pepper and parsley …Dignity stew, My mom use to make this when we were kids. My grand kids love sit now.